In Fireworks we can also extract the colors by importing a color file or GIF file with an external extension of .act. Open the menu shown in Figure 19 and select "replac Swatches". The "Open" dialog box appears. 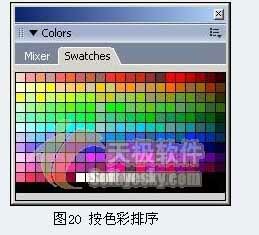 Select a color table file. Here we choose to import the color of a GIF file. At this point, just open the dialog box and just select the GIF file, as shown in Figure 21. Then click the "Open" button, so that we can import the color samples we need. At this time, the color swatch panel displays the color combination in the GIF file we imported, as shown in Figure 22. When we import the color sample above, the currently used color sample does not exist. However, we sometimes need not only to use externally imported color sample combinations, but also want to retain the currently used color sample combination. What should we do at this time? In fact, this is also very simple, we only need to select "Add Swatches" in the popup menu shown in Figure 19, this time will also be shown in Figure 21, "Open" dialog box, we choose a color table file Or the GIF file, and then click the "Open" button, so that the color samples we need are loaded into the current color sample combination. Not only the original color sample is still present, but the color combination in the external file is also the same. Added to the current color sample, the following figure 23 shows the new color sample combination of the GIF file color imported in the "Cube Colors". In most cases, we only need to use Fireworks default sample combinations. Fireworks MX 2004 presets five commonly used sample combinations, namely Color Cubes, Continuous Tone, Windows OS, Mac OS, and Grayscale. ). In the popup menu shown in Figure 19, we can choose any of these five preset color combinations to help us quickly select colors.